The small corner of northeastern Italy that is Friuli-Venezia Giulia has a varied landscape and a unique culture, due to its location along the borders of the region of Veneto to the west, the republics of Austria and Slovenia to the north and east, and the Adriatic Sea to the south. It has a lovely coastline and snow-capped Alps. Throughout the region, Roman ruins and medieval castles can be seen. Its climate also varies greatly from area to area, but is generally humid and temperate. The influences of neighboring Austria and Slovenia can be seen in its cuisine and in the languages spoken locally. Strudel and goulash are staples in this area. Apart from Italian and the local Friulian language, Slovenian is spoken in some areas, including its capital Trieste, where a number of Slovenians live. There is also a small German community here. 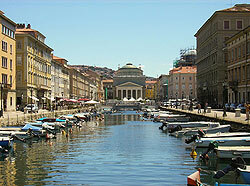 Trieste faces the blue Adriatic and is bordered by beautiful green hills. Because of its location, the closest city in Italy to Central Europe, it has long been a junction of Slavic, Germanic and Italian cultures?and, historically, not always in a good way. But today, Trieste enjoys the legacy of all of these cultures, most notably in its cuisine, which has inherited dishes and cooking styles from Austria and Germany, Slovenia, Czechoslovakia, Greece, Turkey and other nations.